This can be downloaded in a convenient pdf brochure form here. Just right-click and choose "Save Target As..."
Every year, we in the SCA go to events that make memories that last a lifetime. Quite often, these events give you not only memories, but a site token as proof of safe conduct past the Troll and as a little memento of the day. For some events, this can be as simple as a bead on a piece of yarn. 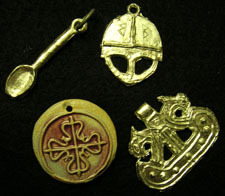 For others, it can be intricately made pewter badges, or even stamped metal medallions. For those that touch the heart, as either a reminder of the dayâ€™s happenings or as an appreciation for the artistâ€™s labor, many of us make a promise to ourselves to keep the token, and to keep it somewhere nice. Sadly, too often this well-intentioned thought goes by the wayside when we get home. For many of us, we have no good way of displaying our tokens, and carrying them all becomes problematic after a few events. So, into the drawer they go. Doomed to become lost amidst the detritus of our lives, they become just one more thing to try and keep track of, one more thing to lose. There are those that take the care to keep a box for our tokens, on the mantle or on the dresser. I applaud this extra step, but like the drawer, they can all too soon become entangled with all the rest, slipping into a source of mild annoyance if we think of them at all. 1st) As stated, a cute and decorative way of displaying the tokens that moved you to begin with. In a public place in your house, it can even be a method of conversation and stories: â€œWhere did you get this one?â€� â€œYou were at Gulf/Lilies/Pennsic War this year? How was it?â€� This becomes not only a great way of connecting and reconnecting with your SCAdian family, but to help keep the stories and memories alive and fresh in you. 2nd) You can use it to track your progress of events through the year, and plan your resolutions for next year. 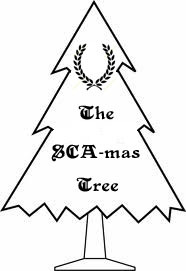 At the start of the SCA New Year (May 1st, in case you needed a reminder), you can take the ones down that donâ€™t strike enough of a memory or art to keep them up, making room for the next year. Or they can be embellished onto a tree skirt, if youâ€™re in so inclined. 3rd) Widespread use of this can be used to inspire others. Groups may try and rise to make a token that is â€œtree-worthyâ€� instead of an afterthought. 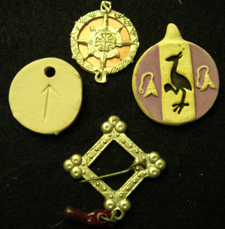 More artisans can be inspired to make or design site tokens for events, knowing that they will be displayed and cherished. 4th) Use of this will also inspire recipients to look more closely at their tokens and mayhaps seek out the makers, thereby increasing the visibility of our artisans and adding to their recognition. 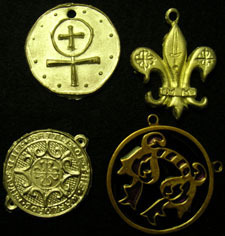 5th) It can also be a great way of displaying duplicate or once you advance, your â€œlowerâ€� order medallions. Honoring your past without trying to look like â€œTHL Master Tâ€�. So, as you can see, even a silly little idea can work to have a much greater impact to you and those around you. I hope you like this idea and further hope that it inspires you in your life and hobby.